Writing under a pen name, the authoress is a semi-retired Accountant from Northamptonshire, England, who now has more time to devote to her hobby of writing. Over the years, Jezebel has written many poems and humorous anecdotes, including some about her numerous pets, and some about her holidays in Great Britain to accompany her photos. Having recently started writing fiction, she now belongs to a local Creative Writing Group in U3A (University of the Third Age) and hopes to improve her writing techniques with a view to publishing some novelty books in the near future. For several reasons, I walk my two dogs separately. When they were young, I used to walk them together with never a problem, until they were attacked more than once by uncontrolled dogs, with hooligan owners. This made them wary of other dogs, and I was worried I wouldn’t be able to control two dogs if they were attacked again, so I started walking them separately. I also found this benefited each of them with more quality time, and they were glad to have my undivided attention for at least half an hour. You would think that litter sisters would be the same, wouldn’t you? Well, they couldn’t be more different. 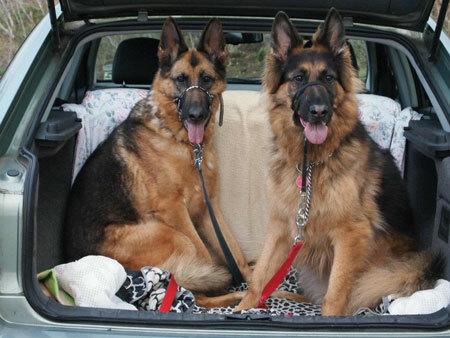 Their father was a huge short-haired sable and gold German shepherd, about the same colouring as one of my dogs. Their mother was a much smaller long-haired black and tan, like my other dog, who was the runt of the litter of nine. She had to fight her way past the other eight pups to get fed, so she always knew how to defend herself against the bigger pups, and she became feisty. She was the dog I chose when I had the pick of the litter, as I wanted a black and tan. I wanted a companion for the dog I had chosen so she wouldn’t be lonely when I was at work The second dog chose me. They always say you should let the dog choose the owner, not the other way round, don’t they? She’s the sensitive one, the first dog is the stroppy one. I used to take one out first, then the other, but the stroppy dog would kick up such a fuss as I walked up my road with the sensitive one, that I decided it was less embarrassing to take the stroppy one first, leaving the sensitive one at home quite happily chewing on her chewy stick. Then the feet sniffing routine started. I would return with the first dog, and the second would spend a moment or two sniffing her feet before we went out. Then on her walk, I would let her lead the way. She would go the exact same way her sister had been. Bearing in mind that I rarely went the same way, I thought this was amazing. I wanted a different second walk, so I often would make the decision to go on a different route. My sensitive dog would enjoy the walk, but I could see by her behaviour that she wasn’t wholly comfortable with it until she picked up her sister’s scent again, when we reached the point where we were back on the route I had taken with her sister. Dogs are so clever, aren’t they? Even more clever though, is the second dog’s behaviour on a day like today, when I deviated from the normal route of one of our regular walks. On the walk with the first dog, I decided to walk around the housing estate near where I live to admire the gardens, which are all bursting into colour. I usually go nowhere near any houses, preferring the open spaces. On our return, the second dog didn’t recognise some of the smells on her sister’s feet, so she spent longer sniffing them. I could hear great inhalations from her. Then it was her turn for a walk, and off we went. We reached the point where we’ve not been before, well not for a very long time anyway, but the way I had been on my first walk. My dog looked a little puzzled, but turned to go that way, leading me on my long lead. She ignores that junction usually, as do I. Bearing in mind that she was not actually sniffing the ground, I am amazed that she knows that was the way her sister went. I tried to confuse her after that by crossing the road before we got to the point where I crossed before. She looked very puzzled again, and started sniffing the ground, like a bloodhound. She is not happy. She doesn’t know where she is. Her sister hasn’t checked this bit out first. It’s not familiar territory. She even ignored the cat lying a few feet away from her. Fifty feet or so later, where I had crossed over the road on my first walk, she lifted her nose from the ground and visibly relaxed. Her sister had been this way. She was happy to be back on track, and we were still nowhere near familiar territory. How on earth does she know?